How Do Airlines Handle Peanut Allergies and Other Allergies? Are you leavin’ on a jet plane? Unfortunately, there are no peanut-free airlines (or airlines free of other allergens, either), so if you have food allergies, do your homework before you book your flight. While no airline can guarantee the complete absence of peanuts or other allergens from a flight, the allergy policy of airlines varies widely between companies. Choose an airline that will accommodate your needs. Allergy Policy: American Airlines does not serve peanuts in-flight, but does serve other nuts, which may contain traces of peanut. The airline can not guarantee that a flight will be peanut-free, will not grant requests for a particular flight to be peanut-free, won't provide a peanut-free "buffer zone" for allergic customers, and won't allow pre-boarding for seat and tray table wipe-downs. Be aware that American Airlines roasts nuts in the first-class cabin while the plane is in flight. Special Meals: American Airlines offers gluten-free, diabetic and vegan (dairy-free) meals for some flights, which must be booked in advance. Allergy Policy: Delta will refrain from serving peanuts on your flight if you notify them at least 48 hours before your flight of your allergy. Cabin service will be instructed to carry additional non-peanut snacks that can be distributed to all passengers onboard. Delta will allow you to pre-board and sanitize your seat. On the day of travel, the peanut-allergic passenger should notify the gate attendants. Delta notes that it cannot guarantee the flight will be peanut-free. Special Meals: Delta lists the name-brand snacks served on short flights on its website. Some of these snacks contain nuts. Gluten-free, diabetic, vegetarian and vegan meals are available for longer flights. You must request a special meal at least 48 hours before departure. Allergy Policy: JetBlue does not serve peanuts on board, but does serve other nuts and other food items, which may be cross-contaminated with peanuts. The airline says it cannot prevent other passengers from bringing nuts or peanuts onboard the aircraft. On request, JetBlue will create a three-row buffer zone around you and ask that passengers in that zone do not eat any nuts. JetBlue also will offer a full refund to passengers whose allergies make it impossible for them to travel. 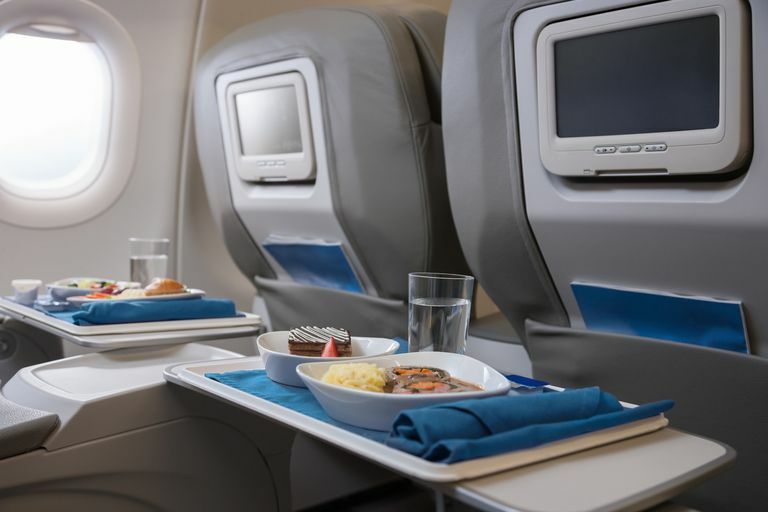 Special Meals: Jet Blue lists in-flight snacks on its website, and offers a limited selection of boxed meals, none of which are allergen-free. Allergy Policy: Southwest normally serves peanuts in-flight, but says it will "make every attempt not to serve packaged peanuts on the aircraft" if a passenger notifies the airline at the time of booking. On the Southwest.com website, passengers can note the peanut allergy under "Add/Edit Disability Assistance Options." Southwest suggests booking early-morning flights, since the planes are cleaned at the end of the day and will be at their cleanest in the early morning. The airline recommends that allergic passengers check-in at least one hour prior to boarding. Passengers will be provided with a "Peanut Dust Allergy Document" to present to the flight crew onboard, which will notify the crew not to serve peanuts. Allergy Policy: United does not serve peanuts or foods cooked in peanut oil in-flight. However, they do serve prepackaged foods that may be cross-contaminated with peanuts. The airline notes that it's "not possible" to prevent other passengers from bringing peanut-containing snacks on board, but says that flight attendants "we may be able to pass along your request to other customers seated nearby to refrain from opening or eating any peanut products that they may have brought on board." Special Meals: Gluten-free and vegan (dairy-free) meals are available on some flights. Special meals must be ordered at least 24 hours in advance. Epinephrine auto-injectors and liquid antihistamines are exempt from the TSA 3-ounce limit on liquids. If you can find a small bottle of antihistamine that fits into a one quart zip-top bag, then you do not need to declare it to security personnel. Since most auto-injectors do not fit into a plastic zip-top bag, your should remove your auto-injector from its bag and send it through the x-ray machine separately. I have found that when I do this, the TSA personnel usually thank me since it saves them the time of trying to figure out what they are looking at on the x-ray screen. Travel can be stressful, and living with a peanut allergy or another form of food allergy can make travel even more challenging, since it may be difficult for you to find safe food at the airport. Make sure to bring along snacks that will travel well and that will pass muster at the security checkpoint (liquids and gels will be rejected and thrown away). And stay in close contact with the airline workers at the gate prior to departure, since they can help you ensure you have a safe flight. Food Allergy Research & Education. Traveling fact sheet.